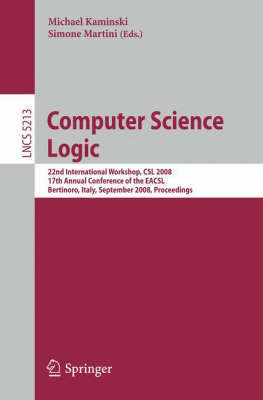 This book constitutes the refereed proceedings of the 22nd International Workshop on Computer Science Logic, CSL 2008, held as the 17th Annual Conference of the EACSL in Bertinoro, Italy, in September 2008. The 31 revised full papers presented together with 4 invited lectures were carefully reviewed and selected from 102 submissions. All current aspects of logic in computer science are addressed, ranging from foundational and methodological issues to application issues of practical relevance. The book concludes with a presentation of this year's Ackermann award.